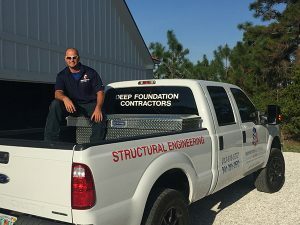 Foundation Masters, LLC is the #1 Seawall Contractor & Marine Construction/Engineering Company in Apollo Beach, Florida. We absolutely love Marine Construction projects of all types including Seawall Construction, Vinyl Seawall, Concrete Seawall, Seawall Repair, Seawall Modification & Retaining Walls. If you need a Seawall inspection please feel free to call the office. Apollo Beach Seawall Problems are a big burden on the whole community. Foundation Masters, LLC is a Licensed Civil Engineering Company Specializing in Seawall Construction and Seawall Repair, and we are very familiar with the Apollo Beach Seawall Problem. Foundation Masters, LLC has and still is currently repairing Seawalls and Retaining walls in Apollo Beach. Call Jeff Earl at 813-614-1718 to schedule a free inspection or ask for the address we are currently working on in Apollo Beach. The #1 design flaw in any earth retention system (seawalls & retaining walls) is a poorly designed drainage system. The drainage system design that is currently being used behind the new seawalls at Harbor Bay CDD Community in Apollo Beach is designed to hold the run off water in a swale (swales behind walls are normally design to remove run off rain water) that runs along the back side of the Seawall, allowing water to soak in and drain through a sand filter. This is a bad idea as the #1 killer of all earth retention system is poor drainage. The sand filter will slowly allow the water to percolate through the sand. This will allow the soils behind the wall to become saturated, causing the soils to become very heavy and also become expansive, this should be the #1 problem one should eliminate when designing a earth retention system. Retaining walls are generally designed using a well drained granular back fill along with swales to remove water. When surface drainage is allowed to penetrate and accumulate in the back fill, the pressure against the wall can be doubled. Puddling of water behind the wall indicates poor grading or a poorly designed wall. The surface of the back fill should be graded to direct water away from the wall, or by the use of drainage channels (AKA Swale) adjacent to the wall to intercept surface water and divert it to disposal. Poor back fill material, such as clay, organics, fine sands and debris can swell, become very heavy and increase wall pressure. Standard construction practice by Engineers, Contractor and Retaining Wall & Seawall supply manufacturers (sheet piles or modular block systems), recommends and always uses pea gravel and/or crushed rock for back fill. It is cheaper than pea gravel (pea gravel is best), sand will slow down drainage and cause pressure behind the wall to build. There is one key factor that is missing with this entire project. The down spouts on the back of these houses are draining towards the seawalls. This will cause an issue down the road. The other concern we see with this newly and still being used seawall system, is the tie back system is being installed at an angle of 30-45 degrees. This angle will allow the tieback to slightly rotate and fail. When using a tie back system, the general rule of thumb is to install the tieback system no more than an angle of 22 degrees, to achieve maximum holding power. Foundation Masters, LLC has and is still currently repairing retaining walls in Harbor Bay CDD Community in Apollo Beach. If you have any cracks in your retaining wall please feel free to call me directly (Jeff) at 813-614-1718 for a free inspection.